An ongoing group to fuel your creative expression, personal growth & radiant wholeness, led by Kerri Lowe. Creative Spring is an ongoing monthly membership for creative, spiritually-minded women who desire a deeper engagement with their creative expression, and thus, a deeper engagement with self. We meet once a week on Zoom (online video) Tuesdays at 12pm EST for 60-70 minutes. Every session together is unique, blending timed writing and reflection, easy feel-good movement, sharing, questioning, mini UHP links and sessions (Universal Health Principles, the healing modality I practice to re-wire your brain + being for more harmony). In a supportive atmosphere, we travel our creative journeys together, experimenting with schedules that work for us, ways of creating and expressing that work for us, as well as mindsets and embodiments that support living in the paradoxical flow and structure that is a creative existence. This group is not about getting famous, or even being a full-time artist, necessarily, but in getting to the heart of it, this desire to create and share in a bigger way, a more deliberate way, for the long-haul. Women who are soul-devoted to the unfolding of their lives via creativity are the women that will find support, inspiration and community in Creative Spring. There is nothing in particular you have to believe to be a part of this group, it is simply about having a yearning and willingness to explore yourself and your creativity on a deeper level, in pursuit of living and creating in the wholeness, harmony and radiance that is your true nature. I will facilitate and hold space for your highest creative potential and well-being, gently guiding you to the richness of life you know you are meant to experience. You will learn creative resilience and discipline, as well as tap deeper into your joy, fulfillment and confidence as a creative woman. This isn't about being told "one right way" to do it. Though I can offer guidance and principles that have stood the test of time, you are your own creator. Everything we do will be led by your own inner guidance of the next best step in your creative unfolding. I am here and the group is here to support that inner guidance to it's full expression. It can be hard to put into language, some of the pursuits I've described above, so I created four goals and intentions that this group will be focused on. If any (or all) of these things are your goals, you will receive value and support from participating in Creative Spring in both the short and the long term. When confronted with life's challenges, the day-to-day and the big, it's desirable to have a creative mindset. In the creative mindset, we let go of rigidity and focus on exploration, pleasure and experimentation. What might be possible for us in our relationships, work, art, business, home life, etc. if we hold ourselves more lightly? The activities we do and Universal Health Principles™ sessions will reinforce creative thinking in all aspects of our lives. The more you know about yourself and trust yourself, the easier your life becomes. Self-knowledge is the key to creating a life that works for you in all ways. Knowing what your strengths are, what your triggers are, and how to trust what you are feeling and experiencing in your body is some of the best foundation you can have as a creative woman. There is no formula for success, there is only you. The exercises we do in Creative Spring will help you develop self-knowledge and trust in your own truth so you can make decisions that fit YOU like a glove. Completing creative projects and putting them out into the world has so many life-affirming ramifications. When we complete creative projects and release them, we are literally changing the story we can tell about ourselves. From the person who wants to write a book/start a blog/make videos/start a podcast/do a performance, etc. to the person who has actually done it. Personal growth work, writing morning pages, all of those things are wonderful - but the biggest personal evolution happens when you complete a creative project. You become someone new, and then the cycle starts again so that you are challenged to live up to your next idea and self. It is a most beautiful way of becoming who you are. In Creative Spring we will focus on finding the right-size projects for you, in relation to the support you have, so that you can build confidence and transform your identity into greater and greater presence and expansion over time as you complete them. 4. Ever-Increasing Wholeness, Harmony and Radiance. I believe we are meant to be healthy, whole, harmonious, grounded, radiant and free. All of my explorations, trainings and practices are ultimately about this - about full conscious embodiment of your joy and power. Western culture focuses so much on the intellect, but that is just one aspect of our ability and consciousness as humans. I use other modalities and frameworks, like The GUMPTION Warm Up (all about embodiment through the chakras) and Universal Health Principles™ (UHP) which works on an energetic level to improve communication flow in the body which helps your body heal itself and become more whole, harmonious and radiant. GUMPTION awareness and embodiment exercises, mixed with the shifts that occur in processing stuck emotions and old belief systems through UHP is the missing link that creative people need to get out of their heads and into their wholeness. In Creative Spring, I offer UHP sessions s well as ways to apply the GUMPTION framework to your day-to-day in service of creativity and general well-being. As a bonus, when you sign up for Creative Spring 2019 you'll get a free GUMPTION Goddess workshop and daily warm-up video! In other words - our goals aren't small! They move from the super practical, to the super intangible and everything in-between. This is why Creative Spring is an ongoing program with no end date. It is there for your evolution and definitely NOT about perfection. Creative Spring is about the unfolding of your Self in this world in a gentle, vibrant, enjoyable way. Everyone has their own process and journey in relation to that. At least three weeks of every month, we meet for a 60-minute live video session on Zoom. Zoom is an easy-to-use, free video platform. In these calls, I will lead you through creative check-ins, free-writing exercises that help you tap into your own inner guidance, and GUMPTION (my signature method) embodiment practices that I have found helpful and transformative in developing my creativity, personal power and well-being. I will also take requests from the group and create the call content based on what YOU need. Our meetings will also include Universal Health Principles™ sessions, an amazing alternative healing modality that gently shifts old belief systems and allows you to step into the next level of ease and communication in your body, mind and heart. This is the special magic sauce of moving past creative blocks and I can't wait to share it with you! Meetings occur at 12pm EST on Tuesdays. A recording will be sent out within 24 hours if you can't make it live. 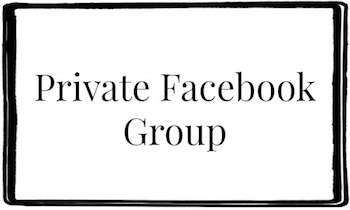 Our Creative Spring private Facebook group is a place to connect with what I like to call your like-minded compatriots! The group will be comprised of women all across the world who will be on the weekly calls (or catching the recordings week-to-week) and pursuing their own version of creative expression and radiant wholeness. The women that I attract are heart-centered and wise (or getting there! as I suppose we all are), are often introverted, or at least need time alone to recharge and for their creative selves to flourish. My style is that you never have to do anything, but I will gently push and encourage you to do what your heart or your creativity is calling you to do that your mind is afraid of. 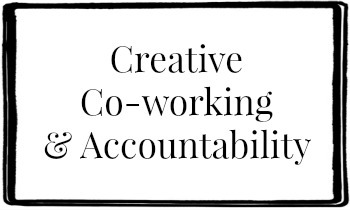 You can use our private Zoom link to set creative co-working dates with fellow members. I show up once a week at different times and we can work together. You are free to come join me (we'll wave hello and then put ourselves on mute) and write. If the time I will be there isn't good for you, you can use the Facebook group to set up partnerships or small groups with schedules that coincide for a weekly writing date. Or you can propose a one-off session to get a specific piece of your project completed. You'll be amazed at how much you get done in an hour just knowing your women are there working beside you. Creative Spring members (of at least 3 months) get a 15% discount on all future online groups, products, workshops and individual UHP sessions. From my GUMPTION Catalyst Circle to things not yet created, (like daily practice warm up videos and more) you are now part of the family! Each month, I'll record an intimate, behind-the-scenes audio diary about everything I'm thinking about that month related to art + business. From my personal creative projects, learnings that come from working with clients, and where I'm headed next in business and art. This audio will be the kind of things I wouldn't necessarily share publicly (even though, as you know, I'm a pretty open book!) including the financial realities of creativity, what makes money, what doesn't, what I'm investing in and why and other learnings about making money and finding fulfillment and self-actualization through creative work. Because I would like everyone to have a foundation in my GUMPTION framework, I will be gifting each member of Creative Spring a free GUMPTION Goddess Workshop. This is a 90-minute online workshop that will take you through the GUMPTION Goddess daily warm-up. This warm up is the best way I've found to activate your whole self, mind-body-voice-spirit, and is my go-to for knowing I'm going to have a powerful day. Going up the chakra system through the letters of GUMPTION (Get Grounded, Up, Muscle, Play/Pleasure, Truth, Inspiration, Om and Now) you will keep your energies humming, connecting to each aspect of self that leads to confidence, clarity, and radiant wholeness. The warm up is flexible and can take anywhere from 10 minutes to half an hour. I will teach you the foundation so that you can explore your own expression of GUMPTION. Workshop comes with a warm up video you can use to follow along until you get comfortable improvising your own warm up. - Getting over your perfectionism and finally doing the creative work that you've been too scared to start. - Feeling energized and encouraged by the people around you (and yourself!) instead of stuck in a loop of doom and gloom about everything that's wrong with you and in the world. - Setting aside time each week for self-reflection and connection to self through writing, seeing that over time, things you once only dreamed about in your notebook have come to life. - Putting your self-care, health and creativity first in your life instead of last. - Knowing the deep satisfaction that comes from discipline begun out of true passion. Forgetting all the projects you think you "should" be doing and working deeply, joyfully on the projects you know you MUST complete. - Trusting that who you are is enough. Your ideas, your point of view, your presence. - Completing the creative projects you've always wanted to complete and sharing them with the world, when you used to keep them locked inside you. - Having a community of women that know your story, your journey, your goals and dreams - and sincerely want to see you succeed in achieving all that your heart desires. There are 4 spaces available in the current Creative Spring group and registration is open in January 2019. The cost is $68/month, month-to-month. Sign up for a quick get-to-know you/interest call where we can learn more about one another and make sure it's a good fit for everyone! Sign up here. Remind me, when are the weekly calls again? Creative Spring maxes out at 12 women so everyone has time for 1-on-1 attention! What if 12pm EST doesn't work for me? Also, if it just really doesn’t work for you let me know. I would like to start a 2nd Creative Spring group and we could find a time that works and see if it flows! Do I have to be an artist? What's the deal? Creative Spring is for writers, poets, songwriters, storytellers, performance artists, dancers, choreographers, musicians, visual artists, creative business builders, aspiring or current coaches and ANY woman, whether she considers herself an artist or not, who would like to claim or reclaim her creative energy and expression. Women who join range from being in their mid-twenties to their mid-sixties. I'm afraid I won't be able to commit. Or I won't get my money's worth. Or...something! Help! One of the things I noticed when I was doing the first round of Creative Spring and also my other free experience, Returning Home, was that "It's not a good time" or "I want to give it my full attention" was something that held people back from joining. And while that's understandable, I couldn't help but think...it's never a good time. Right? This magical "good time" to be creative, to self-reflect, to increase our personal power...hardly exists at all. What I'm interested in is that now is always the best time....AND....when you have an ongoing group, that it always there for you - you don't have to make it be a good time. You can be heavy on the calls one month and need to step away a bit another month when things get busy. But in the background, you always have that community, that way to connect, and that regular reminder of who you are and what you're here to do. Who you are here to become, and keep becoming. I want you to have that kind of consistent support. It's like paying for a monthly gym membership, but even better, because it isn't just the treadmills that are calling - it's me and all the other real live inspiring, flawed, searching, celebrating women who will bring you back to yourself again and again. What if I want to cancel? How does that work? Creative Spring Membership is month-to-month. All you have to do is cancel your recurring payment through PayPal, which you can do at anytime. 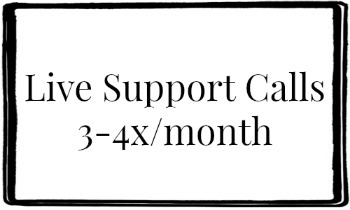 You have nothing to lose - try it and if it's not for you, that's totally cool - just cancel your recurring payment and you won't be billed for the following month. Creative Spring has become the time I most look forward to in my week. It feels like an oasis of connection, a safe space to explore my fears, hopes and desires, as well as a time to reconnect with what’s truly important to me within the creative projects I’m pursuing. I’m inspired by each member of the group and the open and honest way we all share and support each other in our personal and professional growth. There’s never sense of snark or competition or passive aggression in the way we communicate, which is something I’ve (unfortunately) experienced with other groups of women. These ladies are some of the most grounded, open-hearted and talented that I’ve encountered. I’m often in awe of how much resonance I feel with each person’s unique experiences as they share about their projects and aspirations. I also love the fact that we are all at different ages and stages of our lives and can share from our generational knowledge. Kerri is a masterful facilitator, balancing the intention to keep us focused, as well as flowing with the moment-to-moment needs of the group. Her leadership guides us with care, playfulness, strength and heart as she shares her own lessons and struggles with us as well. We all participate equally and continue to learn and grow together week by week on our online calls and FB group postings. I’ve seen myself consistently showing up more joyfully in my own creative projects and business building as a result of the motivation, inspiration and listening ears I receive from the group. And that says A LOT, since I’ve got a newborn to juggle at home! It’s been super supportive to have this group with me to help me stay grounded, remind me to be easy on myself, trust the flow of life and enjoy the changes I’m going through at this transitional time of becoming a mom, starting a new business and being a creative woman in my 30s! I love it. "If there has been one consistent thing in my life, it has been the desire to ideate, explore, and challenge myself to put creative projects into the world. What has changed over the years, is my reason for doing so. Ambition and perfectionism used to rule my creative life, but now my ambition sits side-by-side with healing, truth and the messy glory of being in a body, of being alive." When I was 22, my world got flipped upside-down. I was a folk singer/songwriter with an acting degree and had just recorded my first full-length album. I was about to start touring with my songs and build an audience organically, when suddenly, I lost my voice. For two years, I was unable to sing without pain. Why did this happen to me? It was the combination of two issues that far too many women face. 1) I had a history of bulimia (and other eating disorders) that gave me acid reflux, which damaged my vocal cords. 2) I was sexually assaulted and didn't tell anyone about it. These two things caused a crisis in my voice that meant I had nowhere to go. I got a job in a Brooklyn coffeeshop and prayed to whatever might be listening for the strength to keep going now that I was basically career-less and lost. A straight-A student and general perfectionist, I had no idea how I would survive the humiliation and guilt of what had happened to me. Looking back, that crisis led to everything important to me. It sent me on a journey of healing that involved writing a one-woman show of stories and songs called The Only Thing You'll Lose, meeting my mentor Tanya Taylor Rubinstein in the process and learning about narrative medicine/practice, which is about the power of stories to heal us physically. I went on to become a StoryHealers Transformational Monologue facilitator as well as earn a certificate in Narrative Practice. It forced me to write poetry instead of lyrics, which turned into the next art form I would truly love and be recognized for - invited to perform at several prestigious women's conferences with my poem "When I Have Gumption" and write and record "For Girls Who Had Eating Disorders Not 'Bad Enough' For Treatment," which has been viewed hundreds of thousands of times, shared via Upworthy and Everyday Feminism and most importantly, helped more than one young woman seek treatment when she wouldn't have otherwise. It led to meeting the voice coach who got me my first copywriting job and hired me to help her create courses for independent musicians. It led to me meeting Shannon DeJong, my co-collaborator on ArtistCEO podcast. It led me to meeting my husband. It led to me seeing that my passion is equally balanced between making creative projects myself and facilitating the creative projects of others. It led me to learning about the energetics of health and how our emotional and mental lives affect us physically, leading me to my Universal Health Principles™ certification. It also led me to you. You the woman who is reading this and wanting to more deliberately claim her creative life and expression in this world. Creating this group is important to me because I believe that women's voices and stories and leadership are so desperately needed right now to change the world. By developing ourselves - our confidence, our discipline, our creativity, our JOY - and sharing our creations with the world, we will heal it. We will heal ourselves, our sisters and the planet with our work. Creating this group is important to me because I know how easy it is to get lost in self-doubt or stuckness around putting your work out there. I know what it's like to lose your ability to do the art you love and become demoralized by it. I know what it's like to feel so deeply lonely, like no one understands you and that you'll never be able to match your ambition. And I also know the joy of sharing my words and work, getting deep feedback and literally changing lives because I decided to share it. I know what it's like to break through the depression of chronic illness and find a way to create no matter what. I know what it's like to feel energized by the creative women around me, like I am part of something, knowing that every moment I have ever lived is perfect. Knowing that every day is a chance to become a vessel for beauty and truth, and that there is no rush to the finish line, only savoring the process of discovery. I know what it's like to wake up every day thankful, so f'ing thankful for the work I get paid to do, knowing that I co-created that too - and that there is always, always more to create. There is never "a good time" to build your creative practice. Life will always show up and get in the way (Julia Cameron says to pretend like you will never have an entire free day for your creativity again in your life - and work from there). This is the practice of doing things imperfectly, of starting "before you're ready." And it's one of THE keys to actually showing up for yourself and your brilliance.